Isaac Brynjegard-Bialik: Nice Jewish Artist: From the Genizah:"The Mobile Tabernacle"
I've always loved this image -- a classic Greek style building, on giant wheels. Too ridiculous to be anything other than awesome. I've been working with this idea for a while, and I've previously cut the whole tabernacle as you see it shown above, but this time I tried a view from the side only. 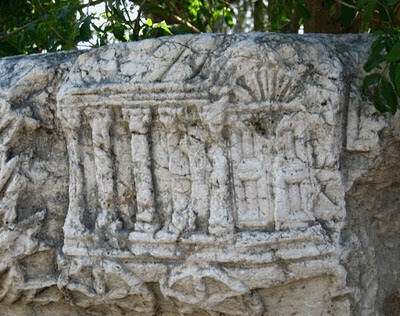 Backed with a page from a book that had been destined for the genizah -- a section about the building of the tabernacle. It's a nice, simple cut -- very geometric, not too serious. I stumbled on to your blog and thought you might be interested in checking out some of our educational materials on the Tabernacle. 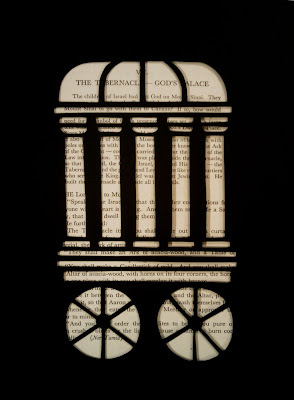 You can access our Rose Guide to the Tabernacle at http://www.rose-publishing.com/tabernacle. You can also download a free e-chart that includes an illustration of the High Priest's Garments. 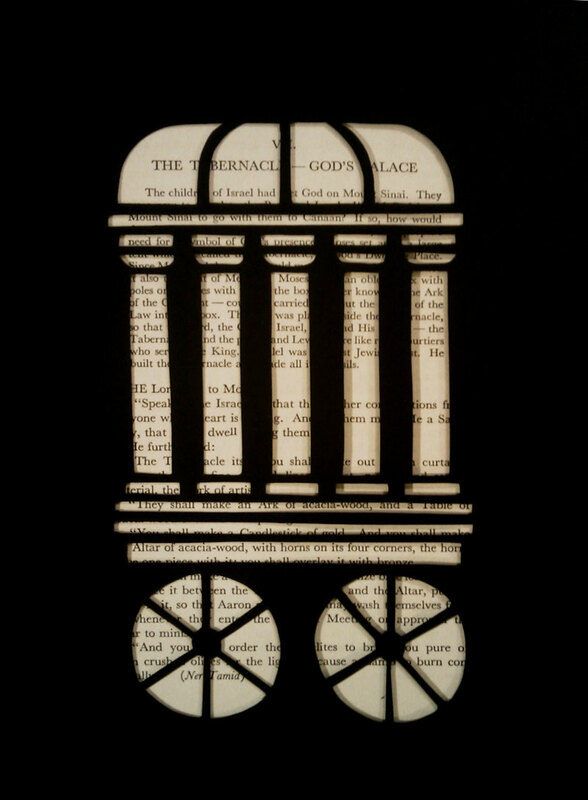 If you have any interest in writing a review for our pamphlet on the Tabernacle, I'd be happy to send you a free copy if you agree to read it and write a 200+ word review, and post it. If you agree to the terms below, please copy and paste the terms, along with your contact information, and send in an email to reviews@rosepublishing.net. We’ll send you a free PDF copy of this pamphlet. Send us the link to where your review is posted and we will supply you with future new product releases for blog posts and reviews. TERMS: Read the pamphlet and write a 200+ word review. The review can be positive or negative, it just needs to be based on the entire product. Post your review on your blog and any consumer retail website (such as Amazon.com, barnesandnoble.com, booksamillion.com, borders.com, christianbook.com, lifeway.com, FamilyChristian.com, or Rose-publishing.com). All have a section on each book’s product page dedicated to customer reviews. To comply with new regulations introduced by the Federal Trade Commission, please mention as part of every Web or retail site review that Rose Publishing has provided you with a complimentary copy of this book or advanced reading copy. Aseh l'cha rav,u'kneh l'cha chaver. From the Genizah:"The Mobile Tabernacle"